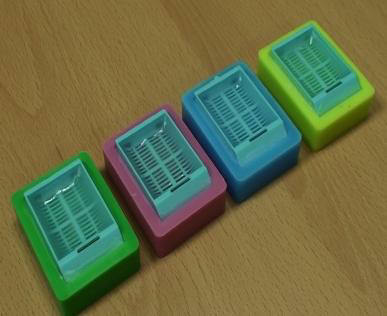 Quick-Ray Mold is an alternative solution for user to prepare the recipient blocks. Made from silicon material, The Quick-Ray Mold allows users to make paraffin recipient blocks quickly and easily t a lower cost. 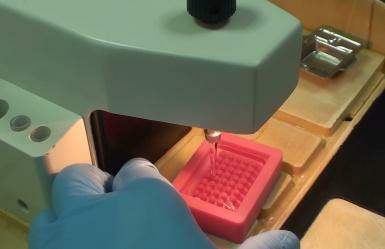 The core sizes of each mold is perfectly match with Quick-Ray Manual Tissue Microarrayer. If stored and handed with care, hundreds of paraffin recipient blocks can be produced by the Quick-Ray Mold. Review this user guide to avoid injury and prevent damage to this product or any products connected to it before you use Quick-Mold. To avoid potential hazards, use this product only as specified in this guide. 1. 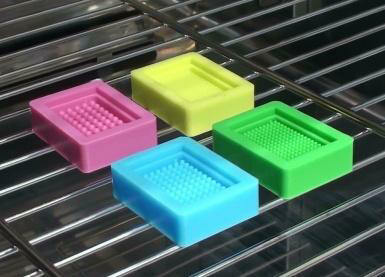 Place the Quick-Ray Mold in a dry oven at 70-80 C for 30 minutes to warm up the mold. Note: this is strongly recommended for lengthening durability of the mold as well as producing good quality recipient blocks. 2. 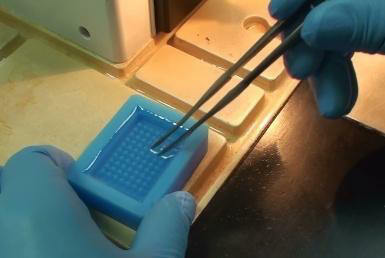 Dispense Liquid paraffin (60-65 C) slowly into the mold kit until the top of core rods are fully submerged. Note: paraffin dispense should be done very slowly so that no bubbles are formed around the core rods. If bubbles are formed, remove them with a heated forceps. 3. Please an embedding cassette on the mold. 4. Dispense enough liquid paraffin into the embedding cassette. 5. Solidify the embedding cassette and the mold at a normal room temperature or at about 4 C for 30 - 60 minutes. Note: If solidified at lower temperature, the block may have cracks in it. 6. Separate the mold from the embedding cassette slowly and gently. 7. Trim paraffin around the edge of the recipient block. 8. 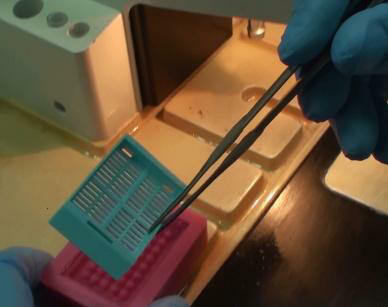 Extract the marked tissue from the donor block by using the Quick-Ray® punch needle. 1) Place the donor block on a horizontal and flat table. 2) Hold the Quick-Ray® in your hand and tighten your grip. 9. Deliver the extracted tissue into the corresponding holes of the recipient block with Quick-Ray® needle by pushing the Quick-Ray® plunger slowly. Then gently push or tap in all the tissue cores to ensure evenness for microtomy. 10. 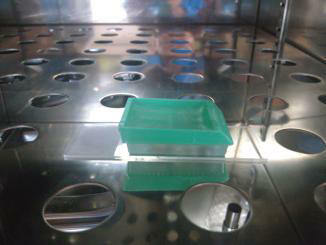 Place the recipient block on a glass slide (facing down) and incubate the block in an oven at 45-50 C for 2 hours. 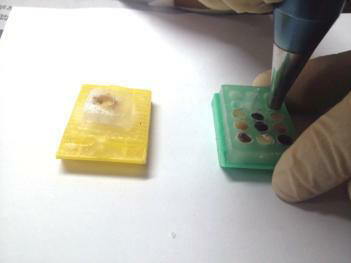 By incubating it, the delivered cores adheres to the hole of recipient block, making it easy to cut on microtome. 11. 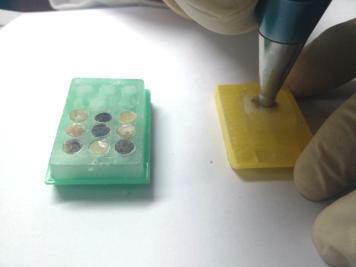 Place the block on a cold plate to solidify and cut the block with a microtome.